I don’t remember coloring as a kid but now, when I have my Copic markers or colored pencils in hand, I am my happiest. I am nowhere close to being good but I practice and take classes to learn new techniques. Last year, My Favorite Things store in Eustis hosted a great teacher, Jane Allen who lives in England and is on their design team. We colored this adorable witch. I love Jane’s technique of adding eyes. This image had dots for eyes originally. This year, Jane’s class was techniques for coloring animals. Our animals were adorable. We learned how to add fine details with colored pencils—the bunny hair was done with colored pencils. Practice pays off eventually. I wish I could color all day but work gets in the way. I will take what I can. Set aside time every day for yourself and be creative. It allows you to clear your head and reduces stress. Nothing is more satisfying than creating with color. Great job! They look real! 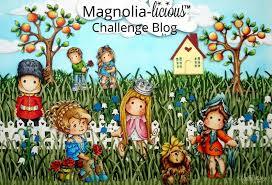 Join us in a challenge!!! 2nd and 4th Tuesday of the month!